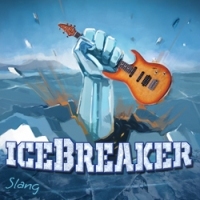 Having struggled to find much information on SLANG and their latest album release, “Ice Breaker”, I wasn't exactly sure what to expect. Although they are certainly playing towards the Progressive style, SLANG extremely hard to describe. Their music seems to be a chaos of sounds. But this chaos seems to work really well to create a crazy listening experience. With their first track being a sort of intro to the album, the second track “The Shield” is packed full of different styles, paces and instruments. Symphonic, epic sounds took over to begin with before my ears were greeted with a sudden extreme change in pace as some spontaneous guitar work found it's way into this track. Having moved on to the third track “Rad”, their whole sound changes and it was hard to believe that this was the same band. “Rad” almost takes the form of an 80s style Rock song with ideally sized guitar solos and excellent pace changes. However, they managed reinstated that Prog sound halfway through the track, perhaps reminding us to expect the unexpected. I was yet again surprised as the album went on as the fourth track “Quaff” struck me with an 80s Hair Metal style riff. Later incorporating some amazing bass solos and drumbeats, SLANG proves that you don't need vocals to create some crazy and unique yet enjoyable music. If I were to describe this band in a word, it would have to be 'Spontaneous'. I can imagine that trying to explain their sound to someone would prove really difficult. It is their use of various styles and instruments such as the Hammond Organ that make SLANG totally awesome. I'm pretty sure they even used the Sitar in “Cyclops”, which is great, as the use of unconventional instruments is always encouraged in my eyes. If I wanted to be really thorough with this album review, I may have to write multiple pages. Such a crazy and unexpected surprise this album was!